The $11.99 Precision Gyroscope is something that will definitely capture the attention of anyone within close proximity to you, wondering whether you have some sort of secret mutant ability that you have kept as a secret all these years, or if you come from a long line of wizards, or are simply just a science junkie. After all, the lines of science and magic do cross sometimes depending on the time zone, and with the Precision Gyroscope, you are now able to perform gravity-defying stunts with the power of science. Tiny ball bearings within will help the gyroscope maintain near perfect balance most of the time – all you need to do is pull the strap and it is good to go, spinning for several minutes before its momentum fails and it is subject to a fall. 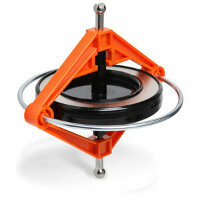 What makes ThinkGeek’s gyroscope better than the others in the market? ThinkGeek claims that this particular model is made from superior materials and crafted to more exacting standards. This is one cool tool that you can get for your little one to keep him or her occupied for some time while you attend to another chore, returning often to keep it spinning and balancing yet again. Any takers?